No blog is complete without the occasional blog about why you’re not blogging, so I couldn’t consider myself a savvy blogger if I didn’t do it as well from time to time. Although things have been pretty sparse around here as of late, I’ve been keeping myself busy around the interwebs. In fact, I am now the new co-editor of Play the Past, along with the insightful and responsible Gilles Roy (so hopefully I can’t do too much damage over there). I have a new article on videogames and memory that just went up on the site, as well. I’ve managed to do a fair amount of offline writing this past year as well, including a conference paper at FDG and a couple of book chapters, not to mention the massive amount of writing that’s been going toward finishing up my coursework for my PhD. 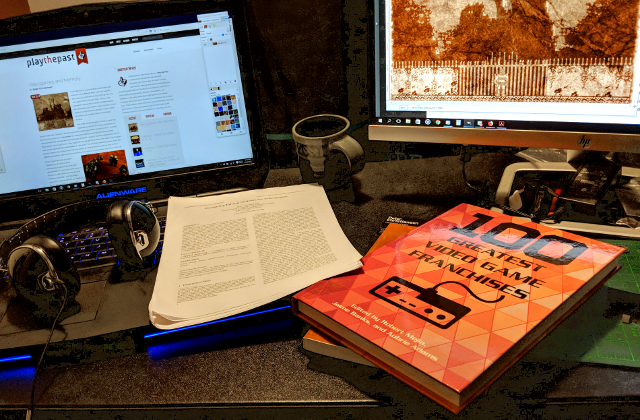 A decent amount of that writing started as musings here on this blog, so while I haven’t been able to spend as much time around here as I would like, the little time that I have been here I consider to have been well spent.